Armagh City, Banbridge & Craigavon Borough Council is delighted to announce that the Food Heartland Awards 2018 in association with Power NI will take place on Wednesday 12th September 2018 at The Palace Demesne, Armagh. The Food Heartland Awards give local businesses and individuals in the agri- food sector a platform to recognise their hard work, passion and commitment to business excellence. The agri-food sector is thriving and diverse. From specialist artisan producers to household brands and global names… from Great Taste and Irish Food Award winners to outstanding restaurants and eateries. 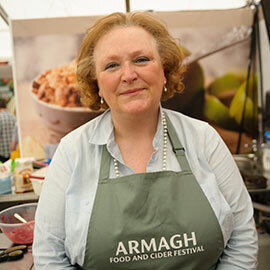 The borough is also home to an abundance of high quality food & drink as well as world renowned products with protected status – Armagh Bramley Apples and Lough Neagh Eels. A prestigious black-tie Gala Dinner Awards Ceremony will take place in a stunning marquee starting with a drinks reception at 7.00pm. The Gala Awards evening will be a golden opportunity to share and celebrate together the very best of the Food Heartland. With great food, sparkling company and glittering entertainment it promises to be a night to remember. Entry for this year’s awards closed on Friday 6th July and the shortlisted finalists will be announced soon. If shortlisted as a finalist, you will be required to attend a short interview with the judging panel. This award recognises the achievement and excellence of food and drink businesses, large and small, from Armagh, Banbridge and Craigavon Borough Council area, in reaching new markets by exporting their products to areas outside of Northern Ireland. (GB and Republic of Ireland will be considered as export markets). How the business plans to maintain and expand the export market. The return on investment, the outcome and outputs of the initiative. This award celebrates new ideas, processes and products that have greatly contributed to a company’s success. This Award will recognise the food or drink business that has most successfully applied and integrated innovation to their company. The judges wish to see how the business used innovation to generate better results within their company. Evidence how the innovation improved business performance? (Turnover, new markets, profit). Any future plans in relation to sustainability. Identification of the dish which is being proposed for the taste test with a clear rationale for why they have selected this dish and a clear outline of the local ingredients being used and why. If shortlisted the applicant will then take part in a taste test with a member of the judging panel visiting your premises to taste your freshly prepared dish. Armagh City, Banbridge and Craigavon is extremely proud to be home of two of three Northern Ireland PGI status products: The Lough Neagh Eel and the Armagh Bramley Apple. In order to elevate the status of these two products this award will look for the best use of either or both the Lough Neagh Eel or Armagh Bramley Apple in a product (includes drinks). Please note this only applies to packaged products and not freshly prepared dishes – see Best Dish Using Local Ingredients award for freshly prepared dishes. Identification of the product which is being proposed for the taste test with a clear rationale for why they have selected this dish and a clear outline of the PGI and other local ingredients being used and why. If shortlisted the applicants will be invited to an interview where the judges will also be able to taste your product. This award will recognise the exceptional success to date of young professionals, managers, students in higher level hospitality studies and or apprentices in any aspect of a local food or drink business. The applicant will need to be 25 years and under on 6th July 2018 working or studying in the Armagh, Banbridge and Craigavon Borough Council area. An endorsement from the employer or a client (if applicable). If shortlisted, the interview will require the individual himself or herself to be present. Customer service strategy/policy and outline how they exceed customer expectations. An overview of their menu(s) offered, including use of local ingredients, and how this was designed with the customer in mind. Applicants of this award will also be required to submit their website information so the judges can view sample menus, images of exterior and interior décor etc. If shortlisted, the finalists will have a mystery shopping visit that will decide the overall winner of the award. Customer service strategy/policy and outline of how they exceed customer expectations. An overview of their menu(s) offered, including details of use of local ingredients, and how this was designed with the customer in mind. Any future plans for their business. Shortlisted applicants for the following award categories; Best New Start, Best Business Growth, Best Export, Best Marketing Initiative, Innovation Award, Sustainability Award, Best Use of a PGI Product in a Packaged Food or Drink Product and Rising Star Award will be required to attend a 15-minute interview/presentation on Tuesday 14th August 2018. Unfortunately, we are not able to reschedule this date and by entering the awards you are agreeing that you will be available for interview on this date. Any shortlisted applicants who are unable to attend the interview will automatically scored a zero in this stage of the competition. Shortlisted applicants for the following award categories; Best Licensed Eating Establishment, Best Non-Licensed Eating Establishment, Best Independent Retail Food Business – a mystery shopping visit will be conducted on the premise and the results of this activity will decide the winners of each category. Shortlisted applicants for the Best Dish Using Local Ingredients will have a visit from the judges to taste your proposed dish within your business premises. This visit will take place on Wednesday 15th August 2018. Data Protection – The information you provide on your entry form(s) will be held on a database to allow processing of your entry. Your details may be used to inform you of other events and services relating to the Food Heartland Awards as well as development opportunities for local businesses that are supported by Armagh City, Banbridge & Craigavon Borough Council. Your contact details will be kept for a maximum of two years when we will contact you to notify you of the Food Heartland Awards 2020. If you have any further questions regarding the Food Heartland Awards 2018 then please do not hesitate to contact us. The Food Heartland brand was originally created to promote passionate producers and quality creators in the Armagh City, Banbridge and Craigavon Borough Council. Being the home of 2 PGI (Protected Geographical Indication) products and many Taste Award winners there is much to be proud of. The Yellow Door, now is its 22nd year, is owned by Simon Dougan (Chef/Proprietor). It first opened its doors as a restaurant in 1992 in the little hamlet of Gilford Co. Down. 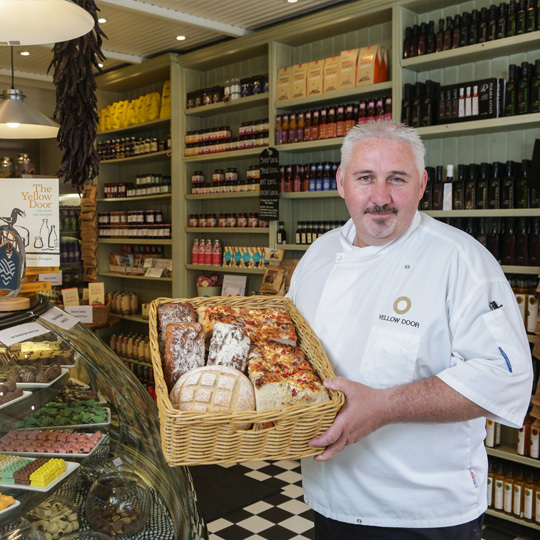 Since then Simon set up the new Yellow Door delicatessen in Portadown and there are now 3 more Deli’s in Belfast and Lisburn. Simon and his team of Chefs, Bakers and Chocolatiers cook everything they serve from scratch which means, Smoking local Fish and meat, churning Ice Creams and Sorbets and baking the renowned Yellow Door Bread and Patisserie from the best local ingredients. The Company even has its own orchard, herb garden, vegetable and soft fruit plots as well as keeping bee hives to produce Yellow Door honey. 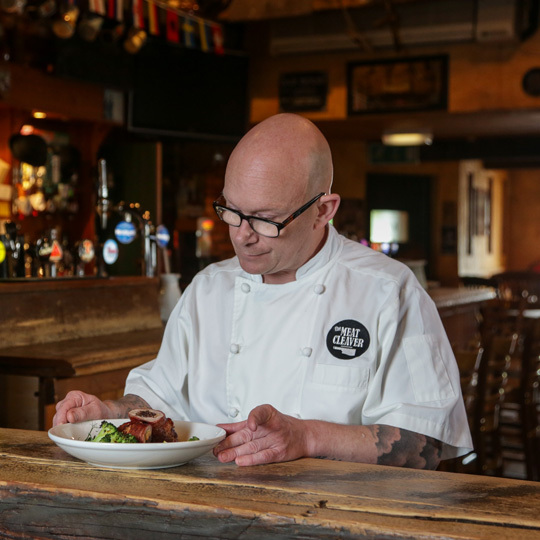 Uluru Bar & Grill Head Chef is Mark McGonigle, a man who simply loves cooking and preparing great tasting food. Our team of chefs work hard in the kitchen and the overall food and drink experience is complimented by our fantastic front of house team. Our team makes sure the best food is put in front of our customers. We have the best team chefs who prepare locally sourced ingredients and serve up the tastiest plates. 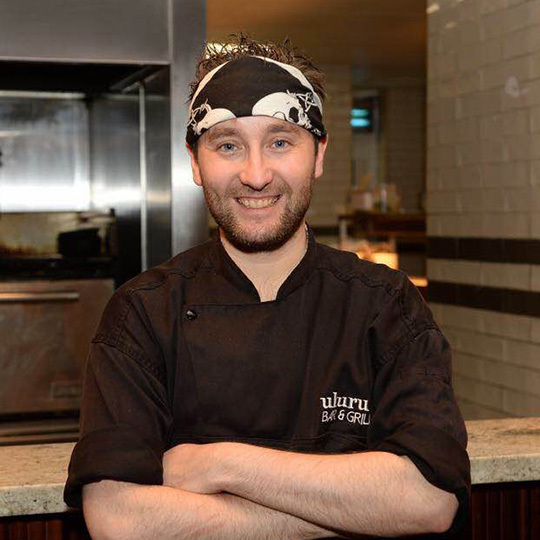 Mark, who is from Armagh, has been cooking great food at Uluru since we first opened over 12 years ago. During this time, Mark has been whetting the appetites of people who travel far and wide to come and sample our food. Mark is a great believer in a chef making a great kitchen even greater so that’s pretty much where he spends most of his time. All of the chefs collaborate to create culinary masterpieces. Come in and see what the #ulurucrew have to offer. Quite simply, delicious! 4Vicars is a small family owned and run restaurant set on the hill of ancient Armagh City, serving a small, daily changing menu in a relaxed environment. 4Vicars sources and cooks the best local fish, meat and poultry, vegetables and leaves, making this restaurant the most interesting and high quality dining experience currently available in county Armagh. Booking for dinner and Sunday lunch essential; booking for lunch recommended. Groucho’s On The Square is a family run bar, which is being extended to create a restaurant. We strive to serve local, wholesome food. 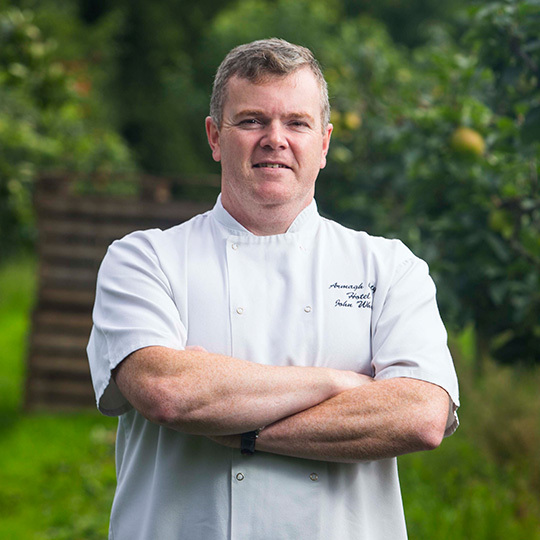 Head Chef Mervyn Steenson has been with us for the past 10 years and lives by the rule of using fresh, local & seasonal produce wherever possible, all cooked from fresh in our own kitchen. John Whyte is head chef at the Armagh City Hotel and has been in the head chef position for 12 years. Before taking on this position he worked in Hastings Europa Hotel for 10 years. Over the years he has helped Armagh become a destination for food and leisure. 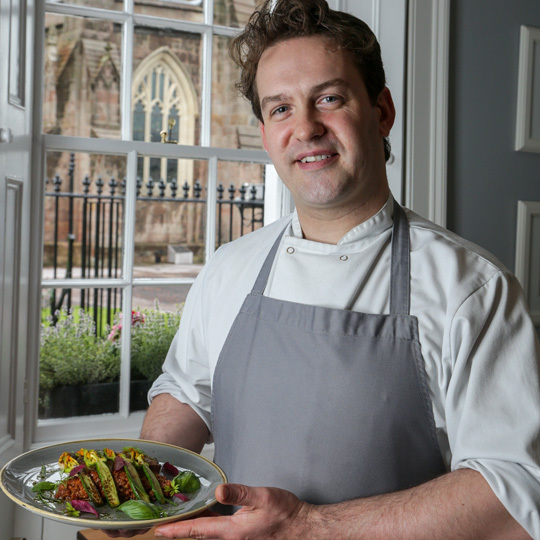 John’s menus incorporate locally sourced food, cooked simply to a high standard and showcase what is best of Armagh and Northern Ireland. 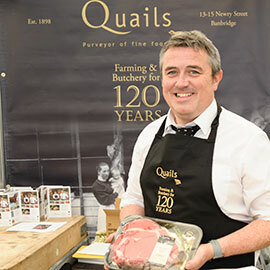 He believes passionately in highlighting the best produce from County Armagh and Northern Ireland. He has also steered the hotel to achieve Taste Of Ulster recognition for over 8 years. He is an active member of The Food Heartlands Forum and seeks to promote local artisan suppliers and their produce. He promotes great food ingredients not only to local customers but also to international guests. John believes this can only be beneficial for the future prosperity of County Armagh and its population. The cluster was supported by Armagh City, Banbridge, & Craigavon Borough Council in addition to a Tourism NI mentoring programme. The group’s objective is to raise awareness of the quality produce, cooking and restaurants in the region. By working together the chefs, in conjunction with their quality local suppliers are promoting the food experience available through their restaurants seasonal menus, providing cooking demonstrations and cookery schools at events and markets in the area. The additional opportunities presented by the Northern Ireland Year of Food and Drink 2016 will generate even greater awareness. The “Marriage” of the best local produce from the Food Heartland and Northern Ireland prepared by the best local chefs to delight our customers and visitors is the aspiration of the group. If you are interesting in becoming a member of the Hospitality Forum, please complete and submit the Expression of Interest Form below, for consideration by the Membership Committee. You will be contacted shortly in this regard.